So pretty... and yet so very, very deadly! Vanilla refers to the flavour produced by the seedpods of a rare, valuable tropical plant that grows only in distant plantations in sultry climes and exotic lands. The word "vanilla" is therefore colloquially used to indicate that something is boring and commonplace. 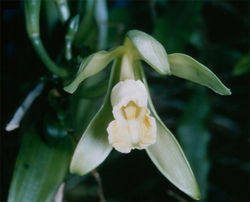 The vanilla orchid is native to Mexico. Historically, cultivation is difficult because the vanilla orchid craves one thing above all others: human blood. Workers in the vanilla fields wear protective clothing; however the vanilla vine is a wiley creature and is often able to confuse and defeat its prey with various cunning stratagems. For example, in 1943, a vanilla vine convinced Mexican agricultural labourer Lars Gunderssen to remove his protective eyeware by pointing and yelling, "Isn't that Oscar Wilde?" Gunderssen removed his goggles, and within instants the fiendish vanilla had sent a tendril through his left eye and around his brain, which was pulled out through the now empty socket. The vanilla dropped the brain on the ground and consumed Gunderssen's brainless corpse. Since Gunderssen's brain still had its right eye attached, he was able to watch the entire process. This is why you should never feel bad about eating vanilla: that's what it would do to you if you gave it half a chance! By the 1960s it became clear that traditional methods of vanilla cultivation were woefully inadequate. The hideous death-rate in the industry lead to high prices for vanilla. Accordingly, the vanilla industry searched for a way to reduce the body count. They came up with two approaches to the problem - psychological and biological. In the psychological approach, botanical psychologists tried to understand where the vanilla was coming from - why such violence? There has been little progress on this front, other than a vanilla orchid in Madagascar breaking down in tears and saying, "I just get angry, is all." The biological approach has also been unable to create a calmer, more docile form of vanilla, but project head Doctor Demonicus has been able to create a hybrid vanilla-strawberry-cocoa plant that he calls the "Neapolitan tree". The use of fruit from this tree in ice cream was widely protested by anti-GM activists, who have since been consumed by ten-foot tall dobermans with compound eyes and jellyfish tentacles in place of limbs. ^ It is a little known fact that, since during harvesting season many Mexican seasonal workers choose to work in the USA, the Mexican farm industry has to make up the labour-pool shortfall with Norwegians. Recent reports have suggested an alarming outbreak in Miami. 50 are rumoured to be dead, one surviving long enough to suggest a strain of vanilla has bred with a triffid to produce a highly mobile specimen.